For a planetary surface to boast extensive areas of both land and water, a delicate balance must be struck between the volume of water it retains and the capacity of its oceanic basins. Each of these two quantities may vary substantially across the full spectrum of water-bearing worlds. Why the Earth’s values are so well balanced is an unresolved and long-standing conundrum. In a paper published in the Monthly Notices of the Royal Astronomical Society (Ed. 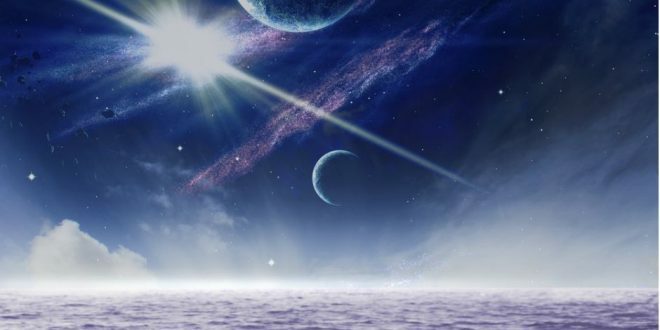 Oxford University Press) the author, Fergus Simpson of the Institute of Cosmos Science at the University of Barcelona, has constructed a statistical model – based on Bayesian probability – to predict the division between land and water on habitable exoplanets. This model predicts that most habitable planets are dominated by oceans spanning over 90% of their surface area (95% credible interval). This conclusion is reached because the Earth is in close proximity to the waterworld limit, a regime where the existence of our species would no longer be viable. “A scenario in which the Earth has less water than most other habitable planets would be consistent with results from simulations, and could help explain why some planets have been found to be a bit less dense than we expected” explains Simpson. In this paper, the ICCUB researcher finds that the Earth’s finely balanced oceans may be a consequence of the anthropic principle – more often used in a cosmological context – which accounts for how our observations of the Universe are influenced by the requirement for the formation of conscious life. “Based on the Earth’s ocean coverage of 71%, we find substantial evidence supporting the hypothesis that anthropic selection effects are at work” explains Simpson. To test the statistical model the ICCUB researcher has also taken some feedback mechanisms into account such as the deep water cycle or the erosion and deposition processes. Also, he proposed a statistical approximation to determine the diminishing habitable land area for planets with smaller oceans, as they become increasingly dominated by deserts. In this study Simpson focuses on the selection effect involving a planet’s ocean coverage. “Our understanding of the development of life may be far from complete, but it is not so dire that we must adhere to the conventional approximation that all habitable planets have an equal chance of hosting intelligent life”, Simpson concludes.